Could a device that's supposed to keep you safe in your car actually put your life in danger? That is what a group of people who bought a six-in-one Crashsafe device are now alleging. DENVER — Could a device that's supposed to keep you safe in your car actually put your life in danger? A group of people who bought a six-in-one CrashSafe device say the devices have exploded in their cars. "I went out at 2:30 p.m. to get the car to run some errands and the whole entire garage was filled with this acrid smoke," said Bridget Bolger, who owned a Subaru. "And then we saw the entire middle console and console had been melted, completely melted." Speaking by webcam from Chicago, Bolger said she still can't believe what apparently caused the damage. 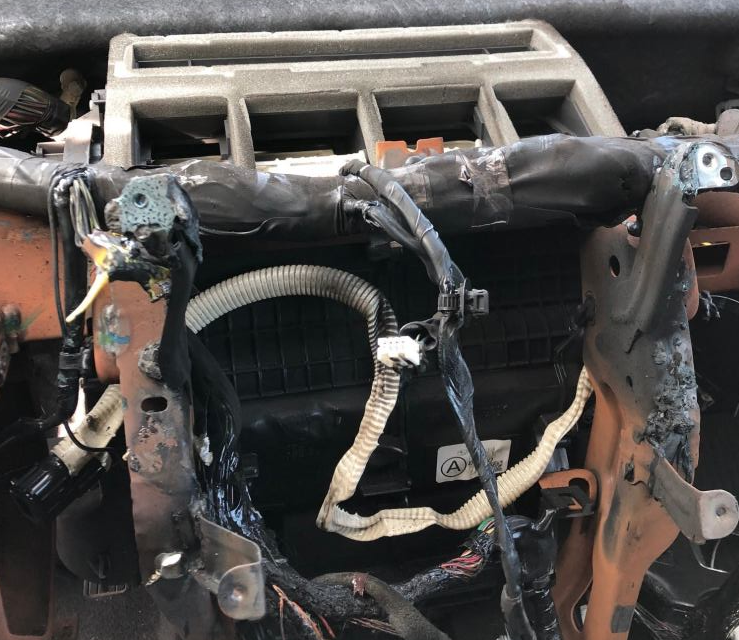 Nobody was in the car when the device started melting. The six-in-one CrashSafe device is promoted online as a flashlight, seat belt cutter, window breaker, phone charger and portable battery. "Something that was billed as being safe actually was the most unsafe thing we've ever put in our car," she said. In September, Denver7 showed you a similar incident. Chandan Shah of Denver was driving in Lakewood when the device melted his console and burned his friend's arm . Since then, he is still waiting for the company to reimburse him for the damage, and several people have reached out to him and Contact7 with similar stories of exploding devices and disturbing photos. "I'm just hoping this thing goes out of the market as soon as possible," Shah said. Bolger said a company insurance adjuster told her they're aware of the problems and are taking the device off the market. But the device is still appearing for sale on the CrashSafe website, and, reportedly, people are still buying the devices. "They said over a million — they said that to my husband — they sold over a million devices," Bolger said. "We saw the Channel7 report, and I was like, 'Wow, this is pretty scary. It's not just an anomaly. It's not just happening to me.'" CrashSafe did not respond to our requests for comment Wednesday, but the company has changed its website to say it does not recommend leaving the device plugged or unattended. Contact7 confirmed last year that the Consumer Product Safety Commission is investigating Shah's report, but consumers contacting Denver7 don't want what happened to them to happen to others. "This device destroyed our car," Bolger said. "It could cause death. I mean, it literally could."